Great employee onboarding is a vital strategy for a growing business. With days, weeks, and months of effort put into finding the best people, it’s essential that you train your new hires efficiently and effectively. Recently, we spent time identifying where our customers are succeeding (and struggling) when implementing onboarding training. From that research, we’ve developed this step by step onboarding guide. It details best practice tips you should use to start implementing employee onboarding training today. With a proper structure and effective training materials, employee onboarding trains new hires faster. A speedier process ensures a more productive learning curve. And in turn, your employees are showing their value to your company faster. Reported as one of the top long-term benefits by businesses, onboarding increases employee retention. It avoids the time-consuming and costly fallout of high turnover, by retaining your employees for longer. Through onboarding training, your employees become aware of their responsibilities and how to correctly fulfill their role. They gain the ability to perform their job better and have a clear path to the goals you want them to achieve. There are substantial costs associated with the new hire process. With the mix of faster onboarding times to increased retention, the right tools combined with a well-defined strategy saves your businesses money by delivering training more efficiently. Hand in hand with a good onboarding strategy is getting the right training software. This is where a learning management system (LMS) comes in. Developed to help you create and deliver your training, you can also measure the impact of your onboarding. Use features like gamification and certification to guide employees through their training. This means your onboarding is fast, effective and impactful. The first step to building an eLearning onboarding strategy is to figure out who’s involved. Depending on your company size, structure and role this varies. For some, it’s a HR or Training and Development task with little to no input from anyone else. Others see it as a group effort with managers, HR, and co-workers all involved. It’s down to your business and the resources available to you when building the team. To make this guide as helpful as possible, I’m going to use an example of how a company might onboard a new marketing hire. Using a spreadsheet (or you can use a project management tool like Asana or Trello if you prefer), I’m simply noting the tasks to be done. I'm also noting the team that's undertaking each task and the person responsible. The level of involvement for each person can be big or small. But as long as you have your key players and they know their roles, you’re off to a good start. Before you jump in and plan content, it’s important to know why you are onboarding your employees – what is the goal? Commonly, we hear that the aim of onboarding is to “acquire the necessary knowledge, skills, and behaviors in order to become effective organizational members and insiders.” But what does this actually mean for your business? If you’re training a salesperson it could be after 90 days of onboarding training they need to deliver a demo for their team that reflects your business’s practices and style. Or using our marketing team example again, let’s say it’s to create a new idea for the marketing plan for the company after 6 weeks of onboarding. For some roles, the goal might be obvious, others not so much. If you are struggling, do some research. Ask team members and managers at what point they considered themselves part of the company. Also, ask at what point do they consider new team members successfully integrated into the organization. Setting this final goal enables you to develop a strong onboarding strategy. Your new employee is also more likely to understand what your expectations are. And in turn, this will support them to complete their training. With your team and goal established, now you can map out an onboarding strategy to nurture your hires to the goal. The simplest and most successful method to do this is to create learning steps or “mini” goals. These, when put together, build a path to the goal. These steps should be incremental, each building on the last to create a focused strategy. For our marketing example, here’s a flow that we'd create for our new hires. These steps can be a mix of online training and face-to-face. Some may last a few hours while others might take days or weeks to achieve. But, as you can see, they create a clear path to your learner hitting that all important end goal. With your steps in place and there to guide you, it’s time to crack on with course content. What is their baseline knowledge? From here, go to your subject experts. They can provide you with all the necessary resources to deliver training at each step. Look internally at your team and the resources you have on hand. You’ll likely find you have a lot of the content you need already. For example, company culture guides and rules of conduct are usually standard across the organization. These can be used in your onboarding. 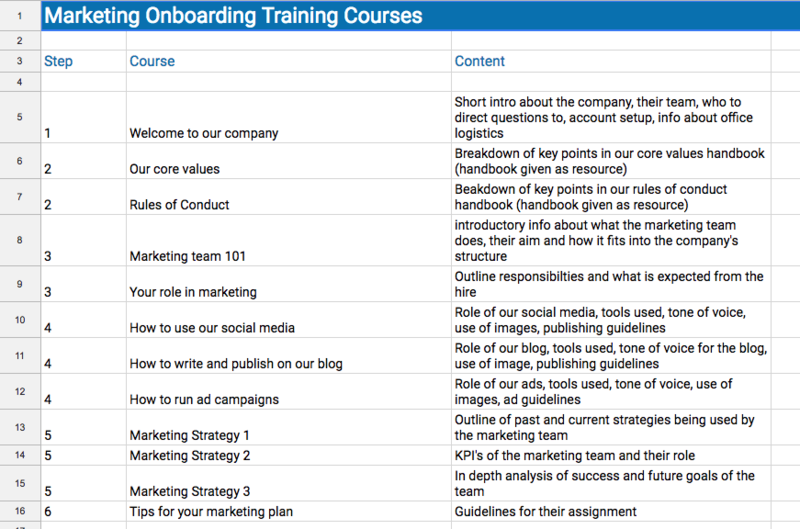 And for our marketing onboarding, there’s eBooks, demos, webinars, blogs, etc. All perfect for repurposing! Crucially, don’t front-load your learners with information. One mistake we’ve seen is a new hire being handed a bulky manual to read. And while that’s a great resource, all that info at once is overwhelming. It doesn’t instill advice and the fundamental message is often lost. Instead, pull out the key elements. You can structure your courses around these smaller, essential learnings. That way your learner isn’t bombarded and they are more likely to take away the information they need. Content in hand, it’s vital that you assess and motivate your learners through their training. Peppering assessments throughout shows that learners have a practical understanding of the training. It also shows they’re meeting their objectives. You can test learners in many ways. Quizzes and exams created in your LMS help new hires to remember the content covered in training. Assignments, face-to-face or uploaded via video or written file to your LMS, gives employees the chance to demonstrate their practical understanding of their training. Rewards for trainees also boost their success. Certificates for completing courses and gamifying the courses with points and badges in your LMS adds a sense of progression. These achievements motivate learners to complete their training. With your steps, content, and assessments developed, it’s time to schedule. Breakdown each of the steps into timelines with due dates that your learner is expected to complete their training by. Ideally, each time a learner completes a step, they should move on to the next one. If you’re using an LMS for your employee onboarding, a feature like Learning Paths can be incredibly helpful. Simply put Learning Paths allow you to group together courses. And once a learner has completed one course or a certain period of time has passed, the next course becomes available. A learner can gradually master a specific topic over a period of time, with more courses being made available to them as they progress. With our marketing onboarding, the new employee logged into the LMS and was automatically enrolled in the first course “Welcome to our company” to be completed on their first day, a time frame we decided. Once completed, they will be automatically enrolled in the next course which we titled “Our core values” and so on. This means your learner is largely self-sufficient and you know they are getting the training they need. Again, this means that your learners aren’t overwhelmed by a long “to be completed” list of courses. You’re building a path to training success instead. When rolled out, your final step is to report and assess your training. Use your LMS reports to research where your learners are succeeding and falling down. Gather feedback through surveys or in-person to establish if your training is achieving the goal of your employee onboarding. From here you can discover and fill knowledge gaps, add to your training and most importantly, develop effective onboarding for your organization. Train your employees with LearnUpon. The powerful learning management system that has the features and knowledgeable team you need to achieve training success..